Attackedastoria Nails: Area 11 nails.. obsessed? Possibly. 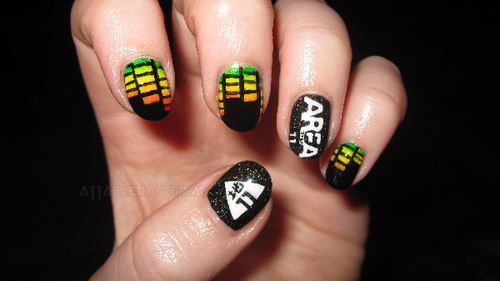 Area 11 nails.. obsessed? Possibly. 'Ello everyone! I whipped these out real quick tonight, mainly because my other mani was chipped.. I've been listening to Area 11 a lot lately, this fun gaijin-rock band out of Bristol. You can check them out here if you're interested! I'm hoping to have more posts after the holidays when it's not so hectic.. thanks to anyone who still bothers to check out my silly little blog.